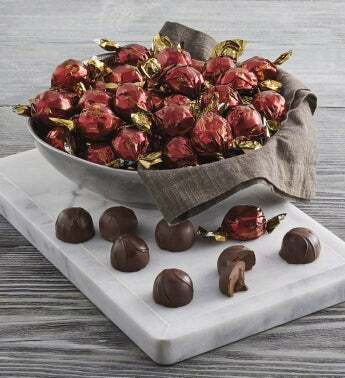 To this day, our gourmet truffles are handcrafted using a chocolate recipe that hasn't changed in more than 30 years. Individually wrapped, our truffles feature a smooth, silky interior and a rich chocolate shell, making them perfectly decadent treats as components in gifts on your dessert table. Contains 50 dark chocolate truffles without gift packaging.